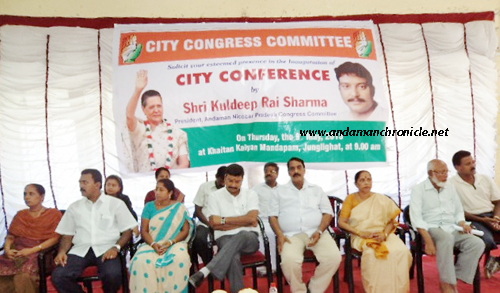 Port Blair, May 9: ACity Conference was organised today at Khaitan Kalyan Mandapam, Junglighat by the City Congress Committee, wherein the PCC President, Shri Kuldeep Rai Sharma was the Chief Guest. Addressing the gathering Sharma urged upon to be united and work for the betterment of the people of the islands. Whatever achievement he has achieved at the President is due to the devoted and selfless work rendered by the party workers, said Sharma He also urged upon the workers to reach to every doors with the policies and programmes of UPA Government, which are for the betterment of the Country and its people. The developments we find everywhere are the contribution of the UPA led Congress Government, he said. And whatever new projects that are coming up in these islands are again the contribution of the Lt Governor who is for the betterment of the Islands and its people. The Administrator is answering to Party's demands because of genuineness and right approach, Sharma said. At the outset, the President, City Congress, Shri A. Selvam welcomed the Chief Guest, dignitaries and the workers. The Chairperson PB Murugan, ZP Adhyaksha Smti Abala Samaddar, Chairperson Social Welfare Smti Ratna Kannan, Vice President Hamid Ali, Dist President RV Reddy, President Mahila Congress Shanta Singh, Pradesh Secretary Marium Bibi, John Robert Babu, Sadhana Lall, Sanjay Rangaia, Sabastian, and Zubaida Bibi also spoke on the occasion who informed that due to personal efforts of Sharma and his amicable approach to the Island's friendly Lt Governor, the burning issues of ATR and Buffer Zone could be solved for the people of these islands, apart from various other welfare measures. The conference later concluded with vote of thanks proposed by Sahaabuddin.